While they have higher efficiency, for most applications tankless water heaters don’t make sense. 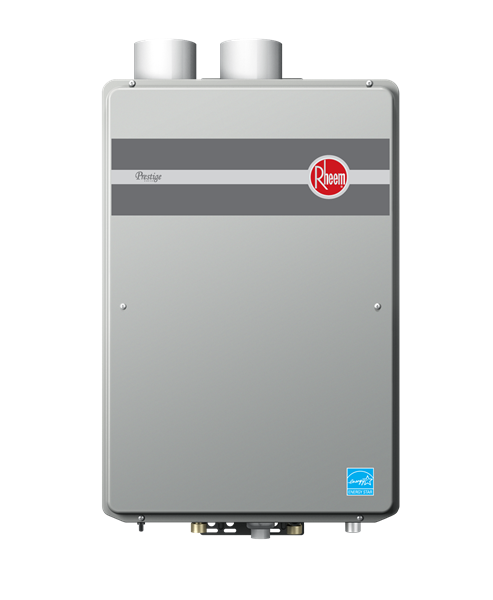 Rheem's Prestige condensing tankless water heater has an efficiency of 94%, 11,000 to 199,000 Btu/hour gas input, a maximum hot water delivery (at a 45°F temperature rise) of 8.4 gpm</strong><strong><strong>, and a minimum flow rate of 0.26 gpm. Most water heaters are storage models. These are insulated tanks holding 20 to 120 gallons with either electric heating elements or gas burners. The storage tank stratifies with hot water at the top and cold incoming water at the bottom, so that as you draw off hot water (from the top), you get consistently hot water until the hot water is nearly depleted. The “first-hour rating” tells you how many gallons of hot water can be delivered in an hour. Storage water heaters constantly lose heat through the tank walls. Even though the tank is insulated, the difference in temperature across that insulated wall is large, so even with a lot of insulation the stand-by heat loss is substantial. Gas-fired storage water heaters that have standing pilot lights replenish some of that lost heat with the pilot, but most of the pilot’s heat is lost up the flue. To address the issue of standby heat loss and running out of hot water, tankless water heaters (also referred to as demand water heaters) were developed decades ago. These are sometimes (especially in other countries) installed at the point of use, say in a bathroom, but in this country they are usually installed centrally in place of standard, storage water heaters. A great feature of tankless water heaters is that they never run out of hot water—assuming the water heating capacity large enough to supply the needed hot water demands. They also don’t have stand-by losses. Because hot water isn’t stored in a tank, there is no heat loss when the water heater isn’t operating (though there will be some losses through the pipes during use). A 2008 Consumer Reports article reported that gas-fired tankless water heaters used about 22% less energy than their storage-type counterparts. A 2010 study by the Center for Energy and Environment in Minnesota found that gas-fired tankless water heaters save an average of 36% over storage water heaters. So far, so good. A key advantage of storage water heaters is that the heating element(s) can be fairly small. Because a significant volume of water is stored and because the tank remains stratified as hot water is drawn off, a properly sized storage-type water heater can provide a family’s hot water needs without requiring a very large flow of gas or electricity to heat the water. Most gas-fired storage-type water heaters have relatively small burners, typically 30,000 to 50,000 Btu/hour (not much larger than the larger burner on a gas range). This means that a half-inch-diameter gas line is usually adequate to supply the water heater. It also means that the air intake (supply of combustion air) can be fairly modest in size. Gas-fired tankless water heaters, on the other hand, often have much larger burners. A typical whole-house model, sized to allow two showers to be used at the same time or for someone to shower while the clothes washer or dishwasher is operating, will have a burner producing as much as 180,000 Btu/hour; the largest tankless water heaters have burners over 300,000 Btu/hour. Supplying the natural gas or propane to such a large burner requires a larger gas-supply line (typically 3/4-inch) than needed for storage water heaters—not an insignificant consideration. Along with the large gas line, these tankless water heaters require a lot of combustion air. A small, 125,000 Btu/hour model operated at full capacity requires about 30 cubic feet per minute (cfm) of air for complete combustion, and a large, 180,000 Btu/hour model requires up to 45 cfm of air at full capacity. Such large airflow requirements can limit the options for placement. An electric tankless water heater large enough to serve a whole house requires a huge current draw. A Seisco Model RA-28 that supplies 2.5 gallons per minute at a 76°F temperature rise draws as much as 116 amps at 240 volts! Most homes have only 200-amp service, and the multiple breakers and wiring required for such large current flows are expensive. For utility companies, the idea of a lot of customers switching to electric tankless water heaters is downright scary, since hot water loads typically fall during periods of peak morning and early-evening power consumption. Utility companies are required to have capacity available for whatever the demand is, and if a lot of electric tankless water heaters were installed in a service district that would result in a significant increase in those peaks. Some tankless water heaters have a minimium flow rate as high as 0.5 or 0.6 gallons per minute, meaning that at lower flow rates they won't come on. This can be a problem with low-flow plumbing fixtures, such as bathroom faucets. Fortunately, manufacturers are responding to this concern. The Rheem H95 condensing tankless water heater pictured with this blog, for example, has a minimum flow rate of 0.26 gpm, the lowest I've seen—though the minimum "activation rate" is somewhat higher at 0.4 gpm. While tankless water heaters save energy compared with storage water heaters, that doesn’t mean they are cost effective. Both the Consumer Reports and Minnesota study mentioned above reported that the significantly higher cost of tankless water heaters resulted in payback periods longer than the expected lifetimes of the water heaters. Consumer Reports found the cost of tankless models to range from $800 to $1,150 plus about $1,200 for installation, compared with $300 to $480 for storage water heaters and $300 for installation. The Minnesota study reported a 20- to 40-year payback for the tankless water heaters. With certain usage patterns, though, the numbers could change. In a vacation home that is only used for an occasional weekend, the standby losses can be a huge percent of the total energy use for water heating, and a tankless model might make more sense. Or, in a commercial building in which a lavatory faucet is far away from the water heater and the hot water demand is very low, a small point-of-use tankless water heater may make sense—even an electric model. On top of the questionable economics, tankless water heaters have significantly greater maintenance requirements than storage models. Models designed for outdoor installation (where supplying combustion air is not a problem) include sophisticated freeze-protection systems. In places with hard water, scale build-up is a significant problem. If the hardness is above 11 grains per hour, experts recommend installing a water softener, according to Consumer Reports, and special provisions may be needed during installation to allow periodic flushing the heat exchanger coils with a vinegar solution. The bottom line is that tankless water heaters simply don’t make sense for most whole-house applications. There are exceptions, as noted above, but for the vast majority of residential applications, storage water heaters make more sense. Members of BuildingGreen.com can learn more about water heaters in GreenSpec. Even the expert technicians of LimitlessHomeSolutions say that tankless water heater are better than the traditional one. The experts of BuildingGreen disagree! Maybe much is different on the two sides of the pond, but here in the US condensing boilers are the state-of-the-art, very reliable, extremely durable, and when coupled with a well-insulated indirect water tank are the most efficient and cost-effective combination heat and hot water option available. Opposite sides of "The Pond"
I don't think I've ever heard of a whole-house tankless water heating system in UK - either gas or electric. Against that, tankless electric heaters for showers are nowadays very common, and in such applications as camping/caravan parks are usually coin- or token-operated to get over the problem of "shower hogs". They are also common for hand-washing in washrooms for small offices and commercial buildings. I can quite believe that whole house tankless heaters have a ridiculously long payback period, so why do they still exist in USA? Also, although much has been made of the high theoretical efficiency of condensing boilers, which, like the CFLs I love to hate, have been pushed by the powers that be, no-one wants to talk about their downsides: high initial cost; finicky setup; frequent, expensive maintenance by specially-trained technicians; and lower physical lifetime of the components which have often been designed for "planned obsolescence" to keep the price down and replacement business up. I've been advising people of this false economy for years. Very high initial costs (including enlarging gas supply from the meter), ongoing maintenance costs, problematic delivery of hot water with either low volume or high volume demand, and significant efficiency drop-off as soon as mineral deposits coat the inside of the small-diameter "high-speed" heat exchanger tubes. Adding an ionic water softener can cause an increase in lead or copper dissolution into the water (copper is a toxin at greater than 1.3 parts per million). While standy-by heat losses can be an issue with tank-type water heaters, in the winter that heat contributes to space heating requirements, and even in the summer the heat loss might help keep a basement dry. In a well-insulated tank, stand-by losses are in the order of 1°F per hour. -maintenance; they have to be flushed each year. I wasn't told this by installer and had to do a $ 700 rebuild last year. -you don't save any money if your teenage daughter never gets out of the shower.